Deputy Mayor Norm Kelly speaks with reporters after the budget vote. Mayor Rob Ford is in the background, speaking with City staff. On Thursday night, city council passed what is essentially a status quo budget, and the last before the October election. Rob Ford had promised he’d deliver strategies for saving more than $50 million; once he finally brought those motions to the floor (he hadn’t shared them with councillors ahead of time), those turned out to be either hypothetical, or cuts to service rather than efficiencies. Of his proposals, 14 out of 18 were voted down by council. Excluding mandatory adjustments that are outside of council’s control, the 2014 budget is 0.03 per cent above projected inflation for 2014. There’s some increased spending on police officers (200 new recruits will be hired); emergency services (61 new paramedics); and 668 new childcare spaces (while this shows up on the City’s budget, it’s actually provincial money that’s paying for those). For much of the two-day meeting, the public gallery was filled with firefighters; they were wearing red t-shirts with “We’re not gravy” stamped across the front. Their funding was the most controversial element of the budget: council voted to cut four fire trucks and 84 firefighters. Fire-prevention officers are being hired to offset the impact, as fire services moves to more of a safety and prevention model. In order to balance the books—municipalities are prohibited by law from running a deficit—councillors voted to increase property tax revenue by 2.71 per cent. (Property tax revenues must be increased each year to match inflation, or the City won’t collect enough money to maintain existing services.) Of the total property tax increase, 0.5 per cent is for the controversial Scarborough subway. There were three separate votes on whether to reopen that Scarborough transit debate during council’s meeting; they all lost 23-22. Once council was locked into the property tax increase, but before the entire budget was finalized, there were also several attempts to put that Scarborough transit money into a reserve fund, pending more information about the subway, or spend it on other priorities. Those motions were ruled out of order. The budget was written in the months leading up to Ford’s loss of authority at City Hall; after council voted to remove his non-statutory powers in the wake of his November crack admission, Deputy Mayor Norm Kelly took over the process of shepherding the draft budget through council. 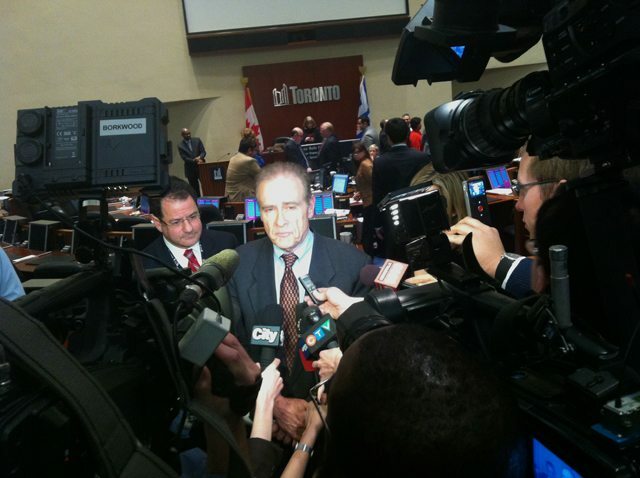 It fell to him to broker compromises on some sticking points with various councillors—a process he referred to as “collegial.” Centrist councillor Josh Matlow (Ward 22, St. Paul’s) remarked that it was the first time in the term that his views had been sought and considered in the budget process, and that this was a refreshing change. Rob Ford did not particularly like this change, and said so loudly and often. The 2014 budget debate did highlight larger structural problems that were left unaddressed this term. Despite Toronto’s booming real estate market and accompanying higher revenues from the land transfer tax, council still faces significant challenges. Two non-binding motions highlight Toronto’s tough structural position: council is asking other orders of government to contribute to the $864 million TCHC repair backlog (which passed 43-2), and asking the province to restore 50 per cent operating funding to the TTC (which passed 42-3). The Ford brothers voted against both motions. Rob Ford, taking a different view, touted his role in securing a solid fiscal future for Toronto: “We’re in good shape, thanks to me, for 2015,” he told reporters. However, this ignores what staff have warned will be a significant challenge for the next council: even with a planned 10-cent TTC fare increase and two–per cent property tax revenue increase, the next term will start with a projected $332-million hole. Ford added that he looks forward to campaigning on his fiscal record.